Summary: Tangram Ski Circus isn`t a world class Japan skiing & snowboarding destination, but pleasant wide trails, far fewer crowds than at interconnected Madarao Kogen, some interesting (off-limits) off-piste tree runs and a super friendly vibe make Tangram a small Nagano ski area we`re happy to have discovered. If you have a few days to explore Nagano powder playground, Madarao Kogen, we recommend hopping across the interconnected trail boundary into Tangram Ski Circus for a half-day or full-day slide. Ironically, there`s really not much of a “circus” going on at Tangram. You won`t be blown away by the terrain, nor is there much off-slope excitement. But maybe the greatest attribute of Tangram is that it`s the antithesis of a three-ring circus — peaceful and quiet. The mellow groomed trails, lack of crowds and surprisingly fun off-piste trees (which we`re pretty sure aren`t accessible without risking your lift pass) kept us smiling during a half-day exploring away from larger main-draw, Madarao Kogen. 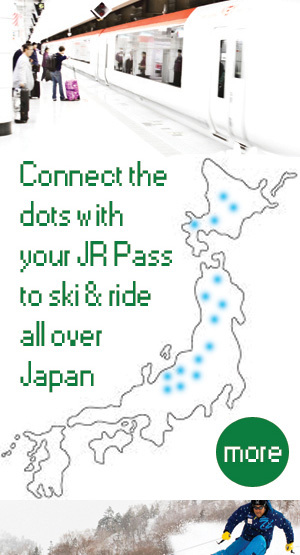 For such a small ski-jo there are actually a few nice options for trail riders. Pisted terrain is by no means extensive enough to keep solid intermediate/advanced riders interested for too long, but trail width, great scenic views off the backside toward Myoko Kogen and low volumes of people to share the pistes with make Tangram a nice spot for relaxed trail sliding. Overall, there aren`t many places that will challenge advanced skiers/boarders, nor are there many places that lower-level skiers/boarders will feel overwhelmed making it a fun place for the family to enjoy together. Beginner: Similar to neighboring Madarao Kogen, there are very wide, low-angle beginner trails constituting much of the central portion of the ski-jo starting from mid-mountain down to the base area. These are excellent zones for learners as there are nearly zero trouble spots to make you feel uncomfortable. 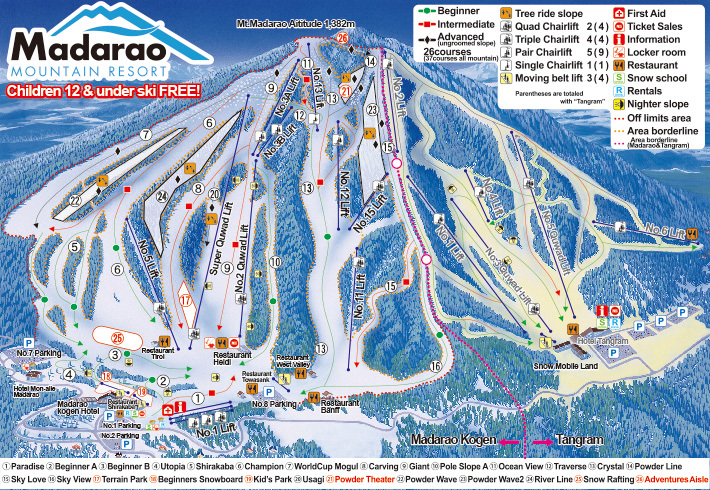 Intermediates: The best groomed trails for intermediates are a mix of Green & Red trails on the Tangram ski map. You`ll find them on the far flanks of the ski area and directly down the center of the resort. On far rider-right is a relatively long trail which acts as the Madarao-Tangram boundary. This trail isn`t very steep but it delivers a fun continuous pitch that allows for some excellent carving along its entire length before bringing you into the base area. Likewise the trails dropping down the center of the ski area and to far rider-left provide similar vertical & enjoyable top-to-bottom run-outs without fear of getting stuck in a flat spot. The Red trails are a bit narrower than other pistes at Tangram, providing twisty-turny runs that require speed control and awareness of people ahead of you around tight corners. Advanced: There aren`t many places that will test advanced skiers/boarders, but the Black trails dropping from the No. 2 Lift are definitely steep enough to demand your attention. These trails are not extremely long, but they are fast & fun all the way to the base (after connecting with Red/Green trails below). You can normally always generate enough speed from the top to never worry about flattening too much near the bottom. In fact, the lower portion of the mountain — although rated Green — provides adequate pitch allowing for fun cruising from Tangram`s highest point to the base area for 500 vertical meters. Is there any official off-piste skiing & snowboarding at Tangram? We`re pretty sure there isn`t. 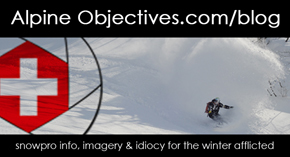 We`ve received conflicting reports from staff and visiting skiers/boarders concerning that topic. Would it have changed our minds about pillaging the fun trees found across the entire (albeit small) ski area? Nope. The fall-lines in the trees are generally short-but-sweet and contain much of the same playful terrain attributes that other ski areas possess in the Iiyama region (aka, Madarao & Togari). The best drop-ins are found along the trail that separates Madarao Kogen from Tangram Circus. Other than off-piste tree riding or directly under the lifts (are we allowed? who cares.) there aren`t any wide open off-piste pow opportunities. You`ll sacrifice quite a bit of advanced riding terrain on the smaller side of the Madarao-Tangram combo lift ticket, but you likely won`t ever sacrifice elbow room. If you know where to sneak off the trail, the only other warm-blooded creature you might see during your short-but-sweet tree runs will be a squirrel. On-piste runs might get a bitmore bottled-up near the base if it`s a busy holiday time and the beginners are out in force, but otherwise, it`ll be smooth sailing. There are 6 lifts at Tangram Ski Circus, non of which will impress you with expediency. We generally don`t care about lift system speed very much in Japan though, as long as the terrain accessed from those slow, out-dated chairs is fun to ride on the way down. As Tangram`s terrain delivers a similar vertical meter drop as larger Madarao Kogen next door, the ride down from top-to-bottom is enjoyable making the slow lifted returns bearable. However, a round-trip journey up the Tangram No. 1 lift then down through the (off-limits?) trees for an approximate 200 vertical meter descent takes about 15 minutes. Compare that to neighboring Madarao and the same amount of time equates to a 3 stage journey accessing the summit of the ski area allowing you to drop into pow filled (definitely not off-limits) tree runs for 440 vertical meters of fun. So yeah, the lifts at Tangram are slow. But does lift speed truly matter? Relax, share a laugh with friends, enjoy the scenery, play in the nice snow and appreciate the lack of crowds. 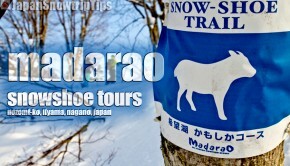 Although Madarao is more renown for its powder conditions, the annual average snow totals at Tangram Circus rival its larger neighbor. Tangram maintains a more northerly aspect across its terrain than does Madarao providing more protection from the sun. Couple that with its heavily forested mountainsides and you`ve got opportunities for excellent high-season (off-limits?) powder tree runs. By the time winter operations are reaching a close (end March/early April) Spring conditions will definitely rule the day and rain could become a factor due to low elevation. The official Tangram Circus off-piste tree riding policy is a bit hazy for us. But one area in the trees is definitely off-limits. It is illegal to cross into the Tangram boundary from the Madarao side via the short strip of trees separating the ski areas alongside the Tangram No. 2 lift. You must enter the Tangram side via the junction point where the Madarao No. 15 lift meets the Tangram No. 1 & Tangram No. 2 lifts. Snowtrip Tip 2: Tangram is small, but rivals its larger neighbor in some big ways. The vertical drop at Tangram Circus is actually longer than at Madarao Kogen (520 vertical meters vs. 440 vertical meters). Likewise, the steepest points of the two resorts are very comparable with Tangram`s highest-angle drop-in at 35° and Madarao`s at 38°. Both ski areas fall away from the same dominant peak — Mount Madarao — making it easy to see how there are some clear terrain similarities between the two. Sure, the total rideable terrain at Tangram is half the size of Madarao, but we found enough fun short-but-sweet (off-limits?) pow stashes in the Tangram trees to keep us smiling for a couple of hours. Snowtrip Tip 3: Less terrain? Yes. Less people? Yes. Less fun? Not really. 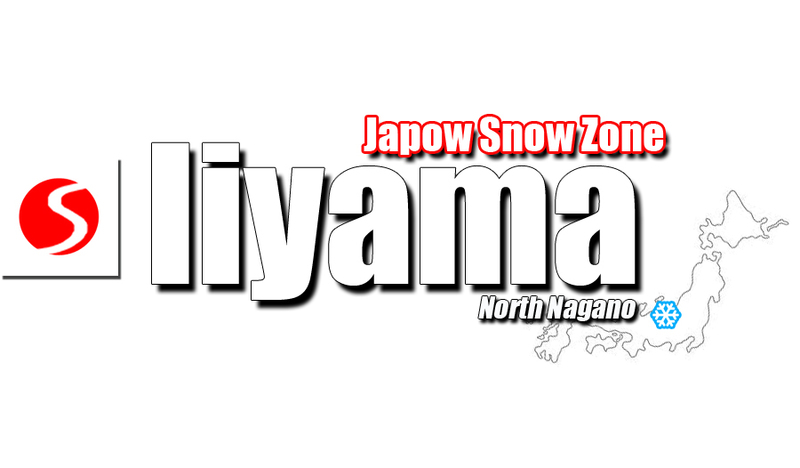 We talked with some long-time visitors of Madarao Kogen — according to them they`d been riding in the ski area`s pow-filled trees multiple times over a 20 year stretch — but they`d never even once hopped over to the Tangram side which is included on a combo pass between the two ski areas. That`s a great indication of how peacefully empty the trails are at Tangram. That`s also one of the main reasons why we had such a great time and recommend Tangram as a great 1/2 day snow slide spot. 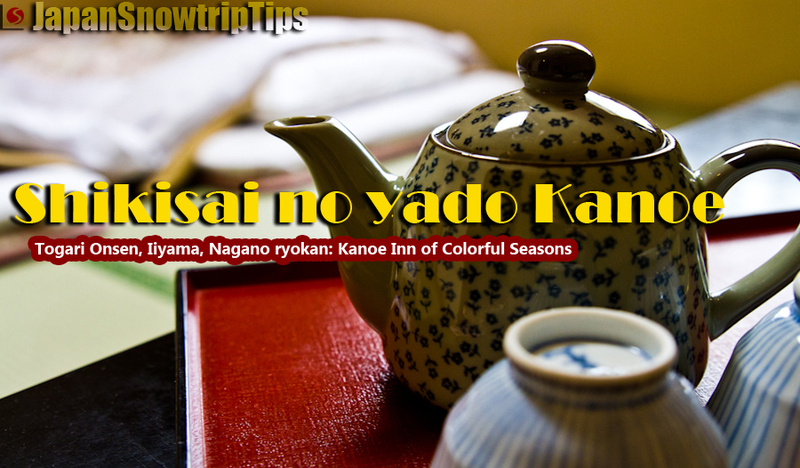 But you won`t want to spend too much time away from Madarao on an epic pow day…that`s where the real action is. 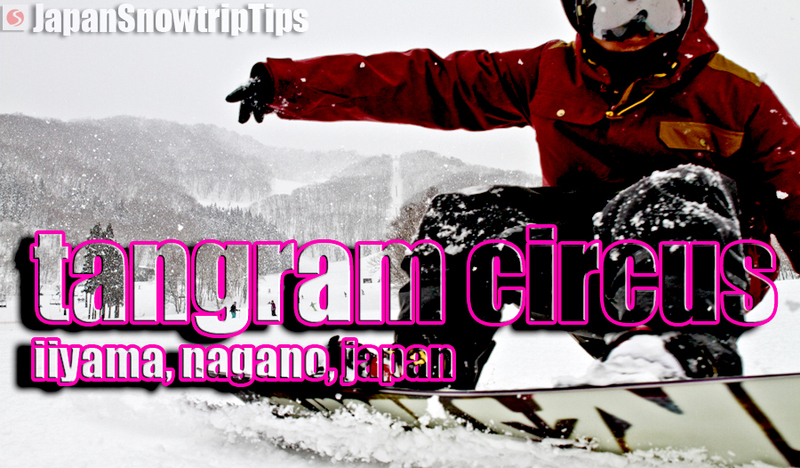 Snowtrip Tip 4: Tangram Ski Circus not wild enough for you? There`s a great backcountry ringmaster just next door. Tangram is fun for a short time, but you`ll never get bored playing in Aki Kitamura`s neighborhood. Madarao Kogen backcountry skiing & snowboarding guide service, North Nagano Outdoor Sports, opens the excellent pow-filled trees from the summit of Mount Madarao with a local ski pro who knows where the best stashes are hiding. After you slide back across the border from Tangram Circus into Madarao Kogen, step out of your skis/board and head down into Iiyama City to experience some of the region`s wonderful cultural activities. 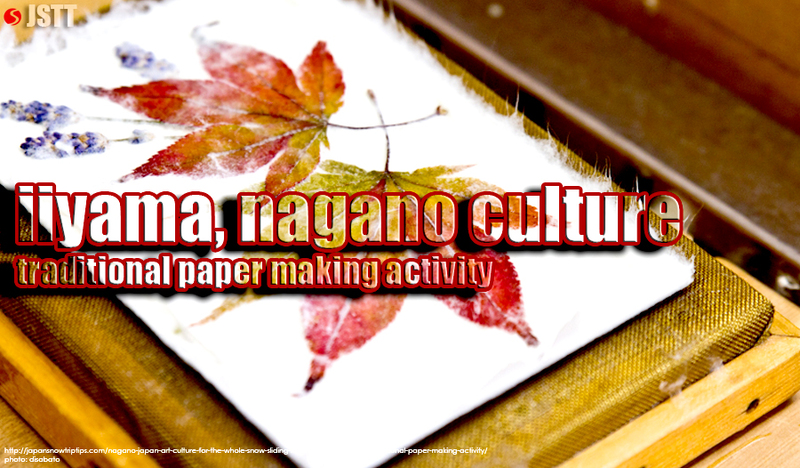 Design your own memorable souvenirs in traditional metal crafting or paper making activities or drink your souvenir during a tasting tour at Iiyama`s famous sake brewery, Kadoguchi.